Since Lembang lays on the slope of an active volcano, the mount Tangkuban Perahu, its temperature is cool and its soil is very fertile, suitable for growing vegetables and flowers. 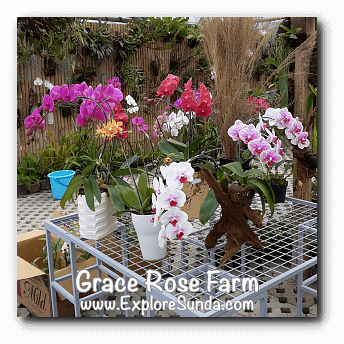 Hence, there are many nurseries selling decorative plants, especially in Cihideung and Cisarua. 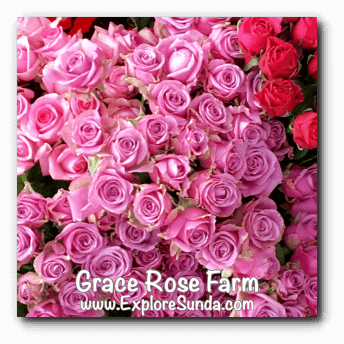 One of the nursery in this area is Grace Rose Farm. 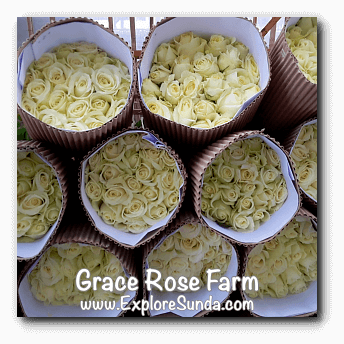 As the name implies, Grace Rose Farm focuses on growing and selling roses as cut flowers. 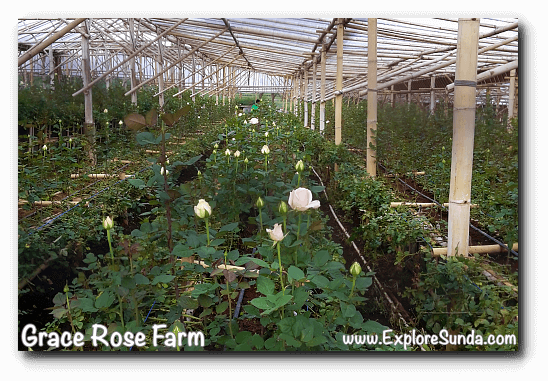 Recently, it opens its farm for public. 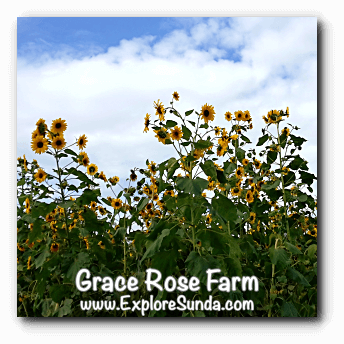 The entrance ticket to explore Grace Rose Farm is Rp. 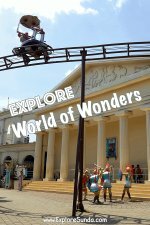 25,000/person, including an optional tour guide and at the end of the visit you can exchange the ticket with a small potted cactus. There is a table with various types of cacti we can choose from. This point of entry also doubles as a shop, we can buy various potted plants here. 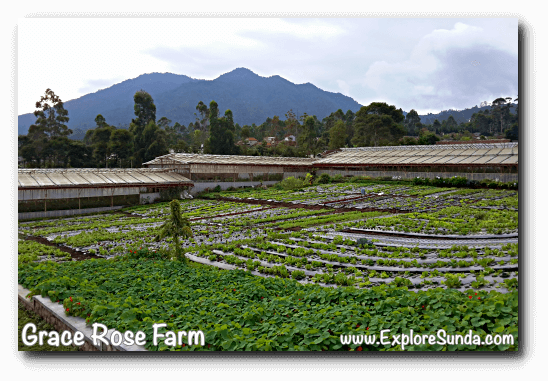 If you really want to know the many types of plants grew in this farm, I recommend you to choose the guided tour. 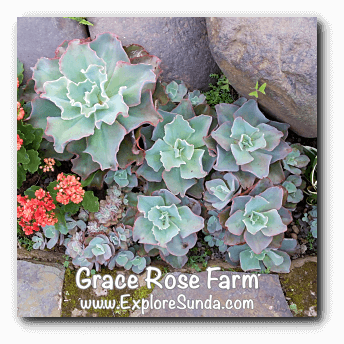 On the other hand, it's okay too if you prefer to roam the land on your own, as long as you remember, we are not allowed to enter the green houses where the roses grow. 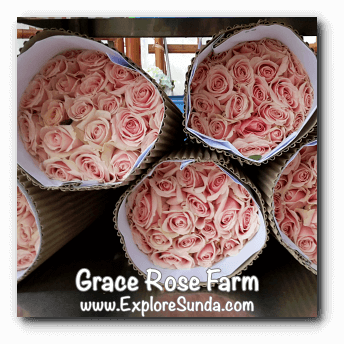 Grace Rose Farm is huge. It spreads on a five hectares of land. 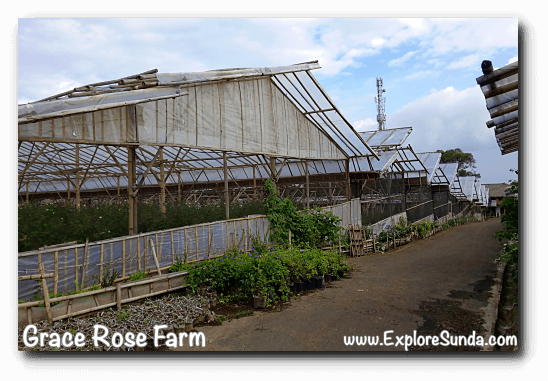 It has rows and rows of greenhouses, where colorful roses are harvested everyday. 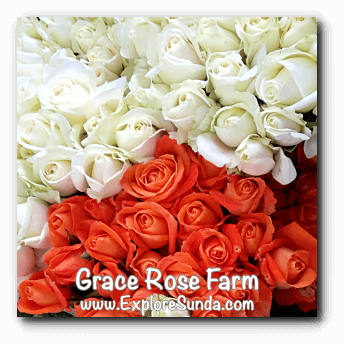 During our visit in the late afternoon we saw thousands of colorful roses are packed, ready to be delivered to big cities, such as Bandung, Jakarta, and Denpasar-Bali. 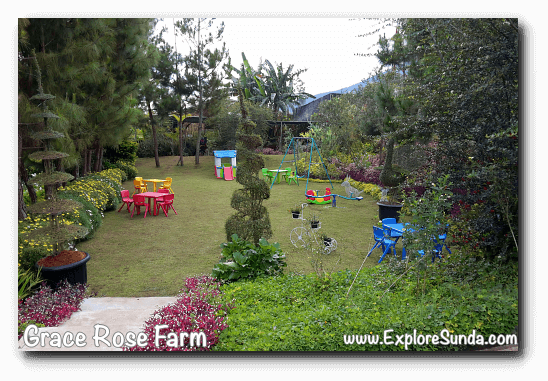 In addition to the roses, some of the land is transformed into a beautiful manicured garden, including a small playground. 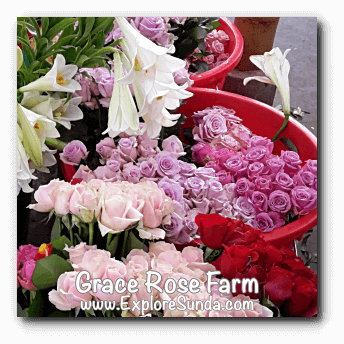 They also grow other types of cut flowers, such as Anthurium, orchid and sun flower. 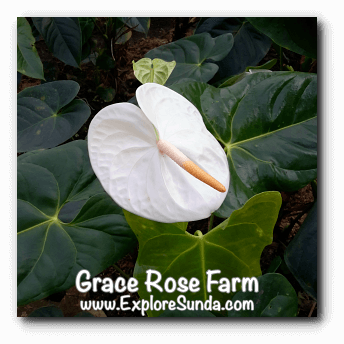 Since any floral arrangement is not complete without great leaves, Grace Rose Farm also grows many types of decorative leaves. 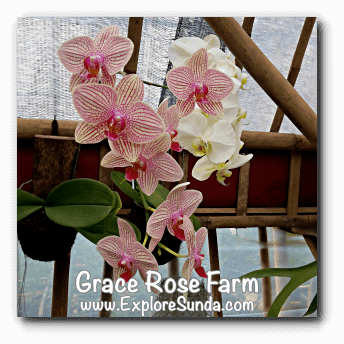 At the back of the farm we found an orchid greenhouse. 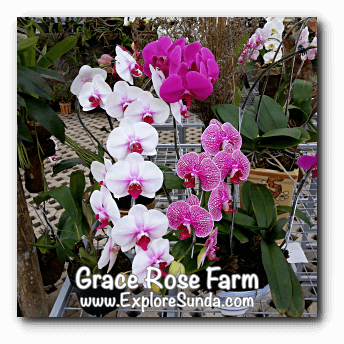 There are many beautiful orchids here and they are for sale! Finally, at the far end of the farm, they grow vegetables too. We can see mount Burangrang clearly as the backdrop of the farm. Similar to the other products of this farm, they are for sale too. 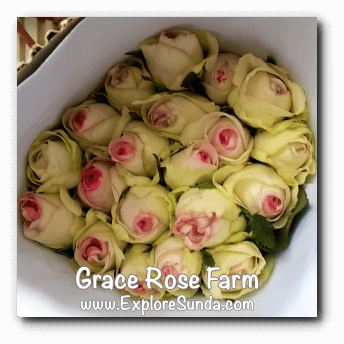 The address of Grace Rose Farm is jalan Kolonel Masturi no. 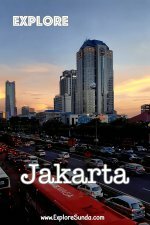 305, Cisarua. The GPS coordinates are 6°47'54.0"S 107°34'25.0"E (-6.798333, 107.573608). There is a signboard on the gate, but it is more visible if you come from Cimahi to Lembang. 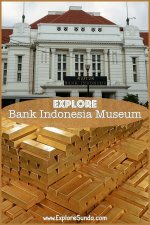 So, from Cimahi you drive up to Cisarua on Kolonel Masturi street until you pass the road to Dusun Bambu, the gate is several meters on the left side of the street. Another way to pinpoint the location is to remember that the farm is right across the street from Curug Cimahi, the Rainbow Waterfall. 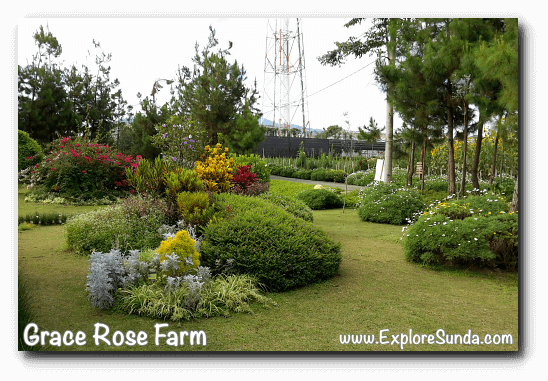 If you like flowers and garden so much, I recommend to visit Orchid Forest Cikole, Floating Market Lembang, and FarmHouse Lembang, as well as Taman Bunga Nusantara in Cipanas Puncak.